Download Directorate Rawalpindi Cantt NTS Test Federal Govt Educational Institutions Cantts Garrisons 23rd 24th June 2018 Roll no Slip from here. Test dates are Saturday, 23rd & Sunday, 24th June 2018. The aim of Federal Govt Educational Institutions is to provide purposeful and quality education. Furthermore, it also aim to provide education to the wards of Armed Forces personnel as well as to civilians. NTS will organize the test for teaching as well as no teaching posts in Federal Govt Educational Institutions Cantts Garrisons. All those candidates who have submitted their application for the jobs in Directorate Rawalpindi Federal Govt Educational Institutions. Now waiting for their NTS Test of Federal Govt Educational Institutions Cantts Garrisons Roll no Slip. List of candidates is available here. You can download FGEI (C/G) Directorate Rawalpindi Cantt jobs test roll slip from the form mention above. FGEI CG Roll no slip can be check in two following ways. First method is to check is via name. While the other way to check is through id card number (CNIC). After entering name or id card number (with out dishes). Candidates can view the list of candidates for Federal Govt Educational Institutes Cantts and Garrisons jobs. You can download as well as get the print. 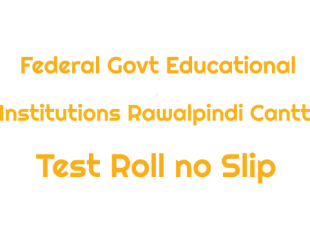 Select the print option and press (ctrl+p) in order to get the print of Directorate Rawalpindi Cantt NTS Test Federal Govt Educational Institutions Cantts Garrisons 23rd 24th June 2018 Roll no Slip.